Armchairs are the original form of luxury seating, originating in ancient Egypt in the homes of rich and powerful people. Today, armchairs are common furniture that be can seen in homes of every size. Our armchairs combine style, elegance and comfort. Please scroll down to see our selection, which you can sort using the control. You can click on an image below to learn more about any chair. 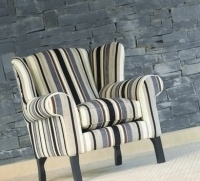 Once you see a chair you like, you can select a fabric from our Designer's Choice and then securely and quickly order on-line.